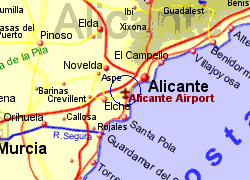 Alicantge Airport is located 9Km South West of Alicante	with good access to the A7-E15 motorway to travel North to Benidorm, Calpe and beyond to Valencia or South to Torrevieja, La Manga or beyond to Murcia and Almeria. The airport has a modern terminal which opened in 2011, which has WiFi available, and is well supplied with cafes, shops and banking/money exchange facilities. 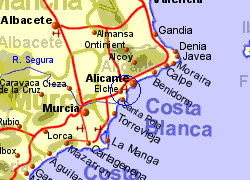 Bus to various points in Alicante run every 20 minutes during the day and evening for approximately €2.60. Bus to Benidorm will cost approximately €8, and to Murcia approximately €5. 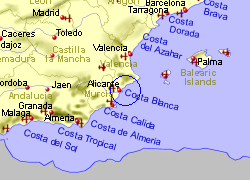 Daytime taxis to Alicante should cost approximately €20, or €70 to Benidorm.